Archaeologists in England have made the rare discovery of two lead caskets from the Roman era but with clear Celtic influence. One of the coffins contains the remains of an adult and infant, probably a mother and her baby. The find is offering a unique insight into Romano-British society and culture. The find was made in a stone quarry by archaeologists from the Wessex Archaeology company who were working for Sibelco, a raw materials solution company in Surrey, in the south of England. Workers during quarrying believed that they had found something. The company contacted some archaeologists to investigate the matter further, as required by British law. After an investigation, the experts announced that a major discovery had been made. According to the Archaeology.uk website “two decorated Roman lead coffins have been uncovered” by the team of archaeologists. They were found with other burials in a small L-shaped burial area. In total there were seven burials in the site but only the lead coffin burials have survived intact. The find is one of the relatively few lead coffins that date from the time when modern England was part of the Roman Empire. According to the BBC there have been only “200 similar lead coffins finds in the country”. These coffins show great variations in their designs and ornamentation. The lead coffins are almost 6 feet long (1.9 meters) and 2.5 feet wide (0.5 meters) and they are 1 foot high (.35 meters). An examination of the two graves indicates traces of wood and that the lead coffins were once “encased in larger wooden coffins” reports Archaeology.uk. The two coffins are made of numerous sheets of lead that had been folded together and then soldered. The fact that the caskets were made of lead, which would have been expensive at the time, indicates that those interred in them were members of the upper class. Being buried in a lead coffin would have been a sign of high status in Roman Britain . The poor were generally buried in wooden coffins or simply placed in the earth. The lead in the caskets had become warped and misshapen over time and this caused their covers to break under the pressure of the soil. This meant that over the centuries the caskets filled up with sand and earth. This is making any study of the human remains in the coffins very difficult. Experts have conducted extensive studies of the bones, but they revealed very little. However, what has been established is that one lead casket had an adult and an infant, possible a mother and child, and in the other was the bones of an adult. The coffin lids had been ornately decorated with beaded straps. These beads were formed into designs mainly of sea shells that are set in shapes, including triangles and circles. The sea shells motifs are very popular in Romano-British graves especially in the area around London. While sea shells were important Roman symbols it seemed that the designs on the lead coffins were based on Celtic iconography and motifs. The shells seem to be connected to beliefs about the afterlife and a journey to the realm of the dead. The decorations on the two lead coffins are very important as they give important clues about Romano-British beliefs and customs. After the Roman conquest of Britain during the reign of the Emperor Claudius there were major cultural changes. Many Celtic tribes became at least partially Romanized, especially members of the elite. This discovery shows that during the Roman period that many local people adopted Roman customs such as the lead casket. However, the unique sea shell motifs demonstrate the persistence of Celtic beliefs especially about religion and the afterlife. The find offers further evidence that Romano-British culture was a synthesis of Celtic and Classic civilizations. 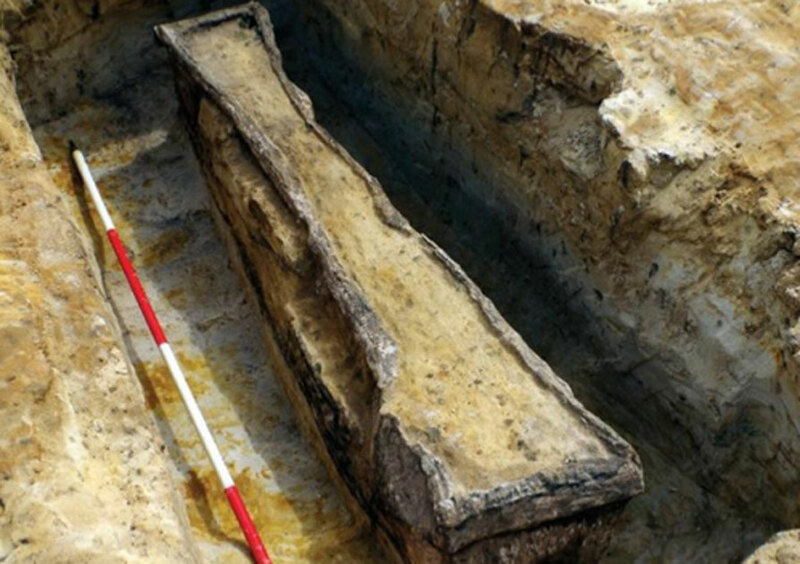 Top image: Two Roman lead coffins were recently discovered in a quarry in Surrey. Source: Wessex Archaeology .